The Stanley Cup playoffs are awesome, and tonight I get to see them live. Skateboarding with dogs looks fun. And a minor-league team hosts a “Seinfeld” night. The Stanley Cup playoffs began Wednesday night, and like I do every year, I looked forward to it like a Christian kid on Christmas. We had great action in all three games, a hellacious overtime between Tampa Bay and Montreal (note to the Lightning: You need a better goalie if you’re gonna win this series, because Anders Lindback ain’t gonna get it done), and a wasted chance to steal a win by Columbus. I’ve preached it here many times before, but the hockey playoffs are by far the best postseason in sports, for drama and excitement. Tonight, though, is the night I’ve really been looking forward to: For the first time in my life I’m going to a Rangers playoff game live, and I am super pumped. 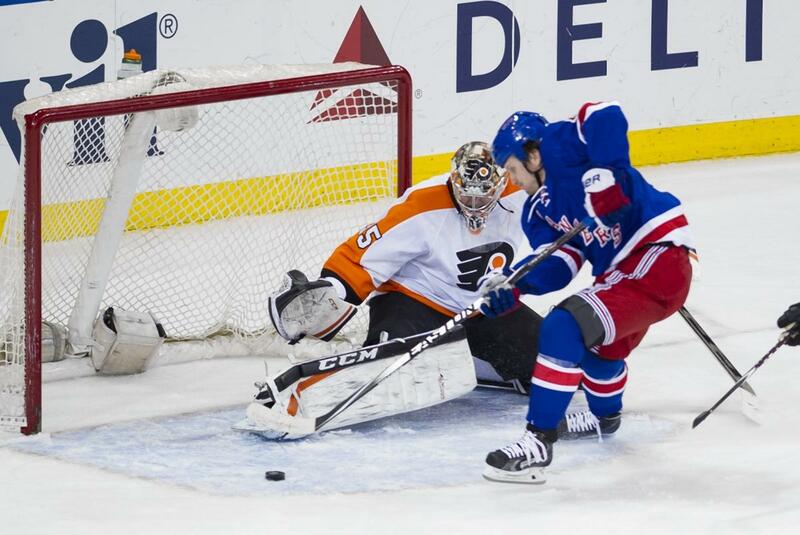 Rangers-Flyers, Game 1. It’s funny, I was a sportswriter for so many years, going to hundreds and hundreds of games as an impartial observer, that you almost forget what it’s like to go to a “big game” as a fan. The nervous excitement all day, the anticipation of walking up to the gate and handing your ticket to the usher, the rush of walking into the arena. As a reporter, you ignore such things, mostly: You’re worried about Internet access, how far your seat is from the playing field, what your deadline is, yada yada yada. But the last couple years since leaving the daily grind has made me appreciate being a fan even more. I plan to savor every moment tonight, and scream my lungs out, and curse anything in orange and black. **Next up, this is definitely an event I will try to get tickets for: On July 5th the Brooklyn Cyclones minor league baseball team is holding a “Salute to Seinfeld” night at their game. There will be Keith Hernandez “Magic Loogie” bobbleheads given out, the Cyclones will take batting practice in puffy uniform shorts (but they’re not playing in cotton uniforms, amazingly! Love that episode where George convinces the Yanks to play in cotton), and there’ll be an Elaine dance competition. My favorite part is that the Cyclones’ home park is going to be renamed Vandelay Industries Park for the night, and latex salesmen get a special prize.